Would you all travel together in the truck? Yes, sleeping all together, it was nice. So it was the same set up at the SPE truck these days? Yes, but actually we travel in a Land Rover. We have a van and a Land Rover. The bikes would go in the van and with 3 people up front. Then 8 in the Land Rover. In a Land Rover ! So you just follow each other in convoy to England? Did you cook in the van? No, all the time in the restaurant. Everything was paid by the federation. Looking back at your time in the trial, do you think that there was more money in the sport back then there is now? I think it’s not more money it was more diversified. A rider in the top 20 of the world can find some money. Right now, only the top 3 or 4 can find money. Did you ever visit the Merlin factory? Yes, yes, I almost had a contract with Merlin but I decide to move to Gasgas. Which bike did you test? Actually, I never tested because I never say I want to go with them. 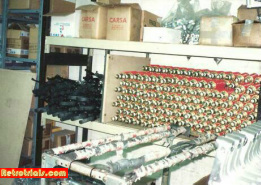 Pere Arpa was the owner of Merlin. He called me several times and says we want you to ride for us next year. They even say to the press, next year Codina is going to ride the Merlin. Some press releases this. I never wanted to go. Because I prefer to go to Gasgas. I decide that I have to move for something that is good or me. Money was not important at this time. Did you ever test the Mecatecno? 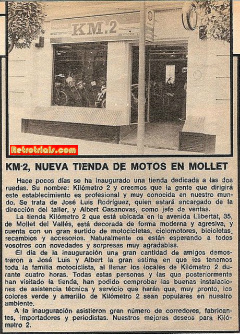 I tested a little bit the bike of Lluis, with Salavdor Garcia also. I tested all of them. The engine was very powerful but the green bike was heavy. The blue and orange bike of Lluis was much better. I like the Mecatecno. Difficult to find the grip sometimes. When the Mecatecno Dragonfly arrived with its 3 spoke wheels, it’s bright orange and blue colours what did the Spanish riders think as it was very different? People liked it, Mecatecno. The problem was that they didn’t have the potential to make many bikes but the idea was there and they spend a lot of money on the competition. 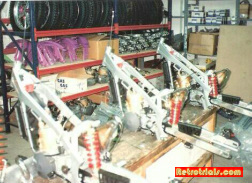 When you rode for Gasgas, did you ever work for Gasgas during the week? Yes. 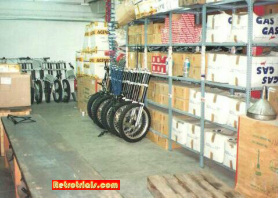 I started to be sales manager for Gasgas in 1989. You mentioned that you were riding all the rounds until 1991 and some in 1992. How did you do this? I started to make some of the business and get some countries, but officially I started in 1991. 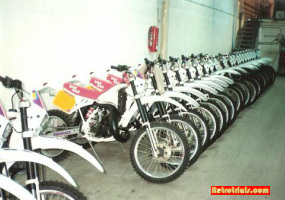 In 1987 you started riding for them, Gasgas just sell to Spain? Yes yes, all the Gasgas network world wide was set up by me, right, that’s for sure. Today many of the distributors are still the ones that I put on. So you set up the deal with John Shirt? Was England one of the biggest markets? Yes, the 2nd after Spain at that moment. 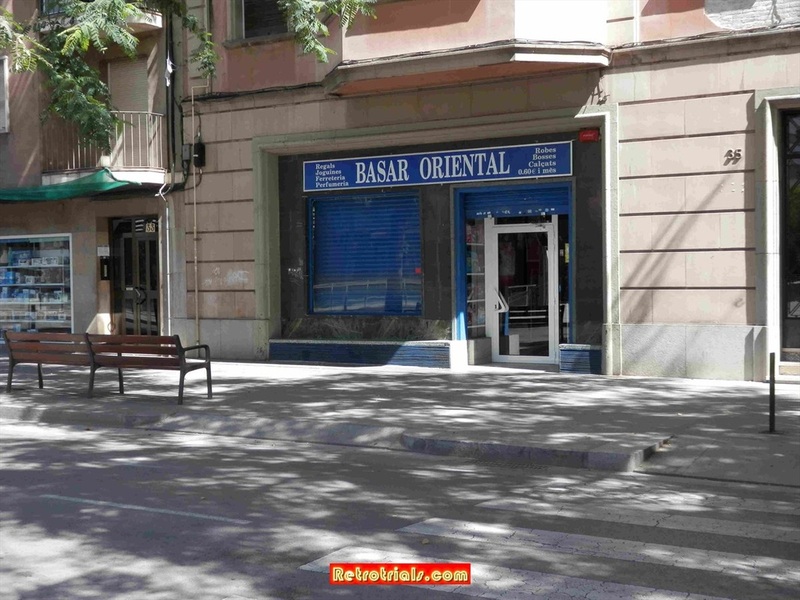 KM.2 was a shop in Martorells de Valles and they were very enthusiastic. They sell a lot of bikes a year. They were selling about 400 bikes a year. They were one of the big dealerships and actually that they actually pay a lot of money to riders, it’s is that they give you a lot of support on the race day. They were a good family to be part of, being part of KM.2 was being in a good club, a prestigious club. What were the names of the people who ran the shop? 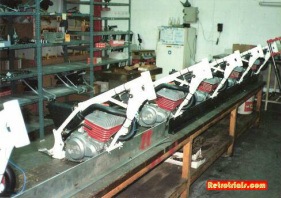 Albert Casanovas who is now the sales manager of Gasgas .Rodregues, who is the mechanic. He now is a classic bike restorer. Why was it called KM.2? Did you have other sponsorship outside of your Gasgas contract? Yes, boots, helmets yes yes yes. The most money I make, more than the motorcycle was the summer schools. I make more money doing this that with the motorcycle and the sponsors all together. Garibaldi. Were you ever sponsored by them? No no, but they try many times. Did you have any other business at the time you worked for GASGAS? Yes, when I started riding the Indoor Trials in 1986, I employed a lawyer to create a company to try and invoice my races and sponsors so that I could comply with the law you know. So we went there and we checked how much money I was making and they said that the best thing is that you make a company, a limited company. I decided a name that I want to call it and I telephoned them the next day and said “we’re going to call it TopFun, is that available “. They called me the next day and say “yes, it’s TopFun “. In 1986 I was riding with the Montesa 307, a special one with the A man from Honda was Makiigna very special tyre gauge so I start selling the tyre gauge, that I still sell to this day. I am still making these. I still remember the part number. I start selling those. Then also I was riding with Gaerne and they don’t have a distributor in Spain, so I start selling gauge and this was in the garage of my home. So I was riding and I was selling at the same time. So I can say in 1989 when I start to make the business with Gasgas it was known that I have other business so Narcis and Piber accepted me. You have had a long career with Gasgas. From the outside looking in you always looked to be the darling boy of Gasgas and within the inner circle. You always seemed to be very close and this no doubt contributed to your long career with them. Why was this? What do you attribute your length of service to them? It’s very easy. First of all I was a very loyal rider. I never ride them at first for the money so I never go there for the money, then I bring to Gasgas a lot of people who bring business to them so ….John Shirt, Japanese, you name it . 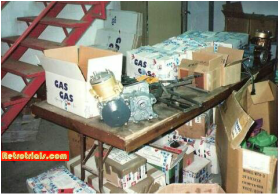 All the dealer network worldwide was arranged by me so actually I was the father of the Gasgas family. You gave them their sales? Without sales there is nothing? Was it a fun company to work for? Yes, but as I say I work a lot of what I have to do and what I do not have to do. Were there difficult times at Gasgas as well? Not during my times no. Actually not. We have some problems with supplies but never was there a problem with the economy, it was just designing problems or things like this. 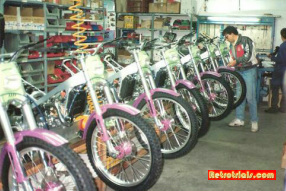 When you started working at Gasgas had you seen your opportunity early on to make these sales world wide? No, at the beginning it was just a question of making a change in my riding career because I was going on business and I have a good vision to generate sales and I organise all of the situation for them for a while and suddenly I only see growth from Gasgas. From the beginning from when I stayed to when I left I only see growth and when I decided to leave it was just another life decision. It’s nothing against Gasgas at all. Every time I ever left a company it is because I made a life decision, but always leaving the door open. When you started at Gasgas they were just selling to Spain? It was almost 5000, maybe more.